We discuss the generalized Lagrange structure of a deformed Minkowski space (DMS), , namely a (four-dimensional) generalization of the (local) space-time based on an energy-dependent “deformation” of the usual Minkowski geometry. In , local Lorentz invariance is naturally violated, due to the energy dependence of the deformed metric. Moreover, the generalized Lagrange structure of allows one to endow the deformed space-time with both curvature and torsion. It is well known that symmetries play a basic role in all fields of physics. In particular, in relativity the most fundamental symmetry is local Lorentz invariance (LLI). Over the last two decades there have been tremendous interest and progress in testing LLI   although theoretical speculations on LLI violation can be traced back to the early sixties of the past century. The theoretical formalisms admitting for LLI breakdown can be roughly divided in two classes: unified theories and theories with modified spacetimes. A formalism of this second kind is Deformed Special Relativity (DSR), namely a (four-dimensional) generalization of the (local) space-time structure based on an energy-dependent “deformation” of the usual Minkowski geometry   . As we shall see, the energy-dependence of the deformed metric in DSR gives rise to a natural violation of the standard Lorentz invariance. However, LLI can be recovered in a wider, generalized sense. Moreover, the deformed Minkowski space (DMS) can be shown to be endowed with an additional geometrical structure, that of Generalized Lagrange Space. This allows one to define in both curvature and torsion. The paper is organized as follows. In Section 2, we review the basic features of DSR that are relevant to our purposes. Lorentz violation in DSR is discussed in Subsect. 2.2. Section 3 deals with the generalized Lagrange structure of . Conclusions and perspectives are given in Section 4. The geometrical structure of the physical world-both at a large and a small scale—has been debated since a long. After Einstein, the generally accepted view considers the arena of physical phenomena as a four-dimensional space-time, endowed with a global, curved, Riemannian structure and a local, flat, Minkowskian geometry. However, an analysis of some experimental data concerning physical phenomena ruled by different fundamental interactions have provided evidence for a local departure from Minkowski metric   : among them, the lifetime of the (weakly decaying) meson, the Bose-Einstein correlation in (strong) pion production and the superluminal propagation of electromagnetic waves in waveguides. These phenomena seemingly show a (local) breakdown of Lorentz invariance, together with a plausible inadequacy of the Minkowski metric; on the other hand, they can be interpreted in terms of a deformed Minkowski spacetime, with metric coefficients depending on the energy of the process considered   . All the above facts suggested to introduce a (four-dimensional) generalization of the (local) space-time structure based on an energy-dependent “deformation” of the usual Minkowski geometry of M, whereby the corresponding deformed metrics ensuing from the fit to the experimental data seem to provide an effective dynamical description of the relevant interactions (at the energy scale and in the energy range considered). An analogous energy-dependent metric seems to hold for the gravitational field (at least locally, i.e. in a neighborhood of Earth) when analyzing some classical experimental data concerning the slowing down of clocks. Let us shortly review the main ideas and results concerning the (four-dimensional) deformed Minkowski spacetime . with being the usual speed of light in vacuum. We named “Deformed Special Relativity” (DSR) the relativity theory built up on metric (1), (2). Metric (1), (2) is supposed to hold locally, i.e. in the spacetime region where the process occurs. It is supposed moreover to play a dynamical role, and to provide a geometric description of the interaction considered. In this sense, DSR realizes the so called “Finzi Principle of Solidarity” between space-time and phenomena occurring in it1 (see  ). Futhermore, we stress that, from the physical point of view, is the measured energy of the system, and thus a merely phenomenological (non-metric) variable2. We notice explicitly that the spacetime described by (1), (2) is flat (it has zero four-dimensional curvature, at least at this level; but see below), so that the geometrical description of the fundamental interactions based on it differs from the general relativistic one (whence the name “deformation” used to characterize such a situation). Although for each interaction the corresponding metric reduces to the Minkowskian one for a suitable value of the energy (which is characteristic of the interaction considered), the energy of the process is fixed and cannot be changed at will. Thus, in spite of the fact that formally it would be possible to recover the usual Minkowski space by a suitable change of coordinates (e.g. by a rescaling), this would amount, in such a framework, to be a mere mathematical operation devoid of any physical meaning. Let us stress that, in this case, contrarily to the electromagnetic and the weak ones, a deformation of the time coordinate occurs; moreover, the three-space is anisotropic3, with two spatial parameters constant (but different in value) and the third one variable with energy in an “over-Minkowskian” way (namely it reaches the limit of Minkowskian metric for decreasing values of , with )   . As a final remark, we stress that actually the four-dimensional energy-dependent spacetime is just a manifestation of a larger, five-dimensional space in which energy plays the role of a fifth dimension. Indeed, it can be shown that the physics of the interaction lies in the curvature of such a five-dimensional spacetime, in which the four-dimensional, deformed Minkowski space is embedded. 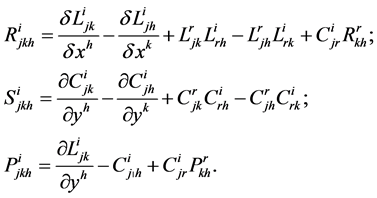 Moreover, all the phenomenological metrics (2), (3) and (5), (6) can be obtained as solutions of the vacuum Einstein equations in this generalized Kaluza-Klein scheme   . (where denotes transpose) namely, standard Lorentz invariance is violated. Therefore, unlike the case of a standard LT, a deformed Lorentz transformation generates a similarity transformation which preserves the deformed metric tensor. Let us also notice the explicit dependence of on the energy . This means that in DSR Lorentz invariance is recovered, although in a generalized sense. The explicit form of the deformed Lorentz transformations can be found in   . where is the set of the energy-dependent pseudoeuclidean metrics of the type (2). This is why it is possible to regard Deformed Special Relativity as a Metric Gauge Theory  . In this case, we can consider the related fields as external metric gauge fields. However, let us notice that DSR can be considered as a metric gauge theory from another point of view, on account of the dependence of the metric coefficients on the energy. Actually, once the MGP has been applied, by selecting the suitable gauge (namely, the suitable functional form of the metric) according to the interaction considered (thus implementing the Finzi principle), the metric dependence on the energy implies another different gauge process. Namely, the metric is gauged according to the process under study, thus selecting the given metric, with the given values of the coefficients, suitable for the given phenomenon. We have therefore a double metric gaugement, according, on one side, to the interaction ruling the physical phenomenon examined, and on the other side to its energy, in which the metric coefficients are the analogous of the gauge functions4. We want now to show that the deformed Minkowski space of Deformed Special Relativity does possess another well-defined geometrical structure, besides the deformed metrical one. Precisely, we will show that is a generalized Lagrange space  . As we shall see, this implies that DSR admits a different, intrinsic gauge structure. Let us give the definition of generalized Lagrange space   , since usually one is not acquainted with it. has a fibre bundle structure. Let us denote by the generic element of , namely a vector tangent to in . Then, an element is a vector tangent to the manifold in some point . Local coordinates for are introduced by considering a local coordinate system on and the components of in such a coordinate system . The numbers constitute a local coordinate system on . We can write synthetically . is a -dimensional, differentiable manifold. Let be the mapping (natural projection) . ( , ). Then, the tern is the tangent bundle to the base manifold . The image of the inverse mapping is of course the tangent space , which is called the fiber corresponding to the point in the fiber bundle One considers also sometimes the manifold , where 0 is the zero section of the projection . We do not dwell further on the theory of the fiber bundles, and refer the reader to the wide and excellent literature on the subject  . Here, is the Liouville vector field on , i.e. .
defined everywhere on and integrable, too (vertical distribution on ). Here, are the coefficients of the nonlinear connection . The basis is called the adapted basis. In particular, both and are d-(covariant) vectors, whereas , are d-(contravariant) vectors. A generalized Lagrange space is a pair , with being a d-tensor of type (0,2) (covariant) on the manifold , which is symmetric, non-degenerate5 and of constant signature. differentiable on and continuous on the null section of is named a regular Lagrangian if the Hessian of with respect to the variables is non-singular. on . In order that is reducible to a Lagrange space, a necessary condition is the total symmetry of the d-tensor . If such a condition is satisfied, and are 0-homogeneous in the variables , then the function is a solution of system (21). In this case, the pair is a Finsler space6 , with . One says that is reducible to a Finsler space. Of course, reduces to a pseudo-Riemannian (or Riemannian) space if the d-tensor does not depend on . On the contrary, if depends only on (at least in preferred charts), it is a generalized Lagrange space which is locally Minkowskian. Since, in general, a generalized Lagrange space is not reducible to a Lagrange one, it cannot be studied by means of the methods of symplectic geometry, on which—as is well known—analytical mechanics is based. A linear -connection on (or on ) is defined by a couple of geometrical objects on with different transformation properties under the coordinate transformation (14). Precisely, transform like the coefficients of a linear connection on , whereas transform like a d-tensor of type (1,2). is called the metrical canonical -connection of the generalized Lagrange space . The two derivatives and are both d-tensors of type (0,3). are the d-tensors of torsion of the metrical connection . namely the hand v-covariant derivatives of the Liouville vector fields. where is a constant and , , , are the components of the energy-momentum tensor. The pair is a generalized Lagrange space which is not reducible to a Riemann space, or to a Finsler space, or to a Lagrange space. Notice that such a result is strictly related to the fact that the deformed metric tensor of DSR is diagonal. namely, the connection coincides with the deformed field. The vanishing of the electromagnetic field tensor, , implies . It is important to stress explicitly that, on the basis of the results of 3.2.1, the deformed Minkowski space does possess curvature and torsion, namely it is endowed with a very rich geometrical structure. This permits to understand the variety of new physical phenomena that occur in it (as compared to the standard Minkowski space)   . Notice that this result follows by the fact that, in deforming the metric of the space-time, we assumed the energy as the physical (non-metric) observable on which letting the metric coefficients depend. This is crucial in stating the generalized Lagrangian structure of , as shown above. Following ref. , let us show how the formalism of the generalized Lagrange space allows one to recover some results on the phenomenological energy-dependent metrics discussed in Section 2.
where and are two integration constants. This solution represents the time coefficient of an over-Minkowskian metric. For it coincides with (the time coefficient of) the phenomenological metric of the strong interaction, Equation (7). On the other hand, by choosing , one gets the time coefficient of the metric for gravitational interaction, Equation (7’). In other words, considering as a generalized Lagrange space permits to recover (at least partially) the metrics of two interactions (strong and gravitational) derived on a phenomenological basis. It is also worth noticing that this result shows that a spacetime deformation (of over-Minkowskian type) exists even in absence of an external electromagnetic field (remember that Equations (45) and (46) have been derived by assuming ). Let us stress explicitly the different nature of the two internal electromagnetic fields. In fact, the horizontal field is strictly related to the presence of the external electromagnetic field , and vanishes if . On the contrary, the vertical field has a geometrical origin, and depends only on the deformed metric tensor of and on . Therefore, it is present also in space-time regions where no external electromagnetic field occurs. As we shall see, this fact has deep physical implications. A few remarks are in order. First, the main results obtained for the (abelian) electromagnetic field can be probably generalized (with suitable changes) to non-abelian gauge fields. Second, the presence of the internal electromagnetic hand v-fields and , intrinsic to the geometrical structure of as a generalized Lagrange space, is the cornerstone to build up a dynamics (of merely geometrical origin) internal to the deformed Minkowski space. The important point worth emphasizing is that such an intrinsic dynamics springs from gauge fields. Indeed, the two internal fields and (in particular the latter one) do satisfy equations of the gauge type (cfr. Equations (51) and (52)). Then, we can conclude that the (energy-dependent) deformation of the metric of , which induces its geometrical structure as generalized Lagrange space, leads in turn to the appearance of (internal) gauge fields  . (with self-explanatory meaning of the notation). In Deformed Special Relativity, two kinds of breakdown of Lorentz invariance occur. One is straightforward, and is due to the very dependence on energy of the metric coefficients. The second is more subtle, and is related to the mathematical structure of Generalized Lagrange space, which allows one to endow deformed Minkowski space-time with both curvature and torsion. This is a basic result, not only from the theoretical, but also from the experimental side. Indeed, a number of experiments carried out in the last two decades have shown that a variety of new physical phenomena do occur in deformed space-time   . In all the experiments performed so far, a remarkable space anisotropy has been observed. This deserves a thorough theoretical and experimental investigation. Kostelecky, V.A. (1999, 2002, 2004) CPT and Lorentz Symmetry I, II, III. World Scientific, Singapore. Cardone, F. and Mignani, R. (2004) Energy and Geometry—An Introduction to Deformed Special Relativity. World Scientific, Singapore. Cardone, F., Mignani, R. and Petrucci, A. (2011) The Principle of Solidarity: Geometrizing Interactions. In: Dvoeglazov, V.V., Ed., Einstein and Hilbert: Dark Matter, Nova Science, Commack, 19. Mignani, R., Cardone, F. and Petrucci, A. (2013) El. J. Theor. Phys., 29, 1. Miron, R., Jannussis, A. and Zet, G. (2004) In Tsagas, Gr., Ed., Proc. Conf. Applied Differential Geometry—Gen. Rel. and the Workshop on Global Analysis, Differential Geometry and Lie Algebra, 2001, Geometry Balkan Press, 101. Miron, R. and Anastasiei, M. (1994) The Geometry of Lagrange Spaces: Theory and Applications. Kluwer, Alphen aan den Rijn. Miron, R., Hrimiuc, D., Shimada, H. and Sabau, S.V. (2002) The Geometry of Hamilton and Lagrange Spaces. Kluwer, Alphen aan den Rijn. Steenrod, N. (1951) The Topology of Fibre Bundles. Princeton University Press, Princeton. Of course, Finzi’s main purpose was to apply such a principle to Einstein’s Theory of General Relativity, namely to the class of gravitational phenomena. However, its formulation is as general as possible, so to apply in principle to all the known physical interactions. Therefore, Finzi’s PS is at the very ground of any attempt at geometrizing physics, i.e. describing physical forces in terms of the geometrical structure of space-time. 2As is well known, all the present physically realizable detectors work via their electromagnetic interaction in the usual space-time M. So, is the energy of the system measured in fully Minkowskian conditions. 3At least for strong interaction; nothing can be said for the gravitational one. 4The analogy of this second kind of metric gauge with the standard, non-Abelian gauge theories is more evident in the framework of the five-dimensional space-time (with energy as extra dimension) embedding , on which Deformed Relativity in Five Dimensions (DR5) is based (see ). In , in fact, energy is no longer a parametric variable, like in DSR, but plays the role of fifth (metric) coordinate. The invariance under such a metric gauge, not manifest in four dimensions, is instead recovered in the form of the isometries of the five-dimensional space-time-energy manifold . 5Namely it must be . 6Let us recall that a Finsler space is a couple , where is be an N-dimensional differential manifold and a function defined for and such that is a possibly non symmetric norm on . Notice that every Riemann manifold is also a Finsler space, the norm being the norm induced by the scalar product . A finite-dimensional Banach space is another simple example of Finsler space, where . 8Contrarily to ref. , we shall not consider the restrictive case of a classical (non-relativistic) expression of the energy, but assume a general dependence of E on the velocity (Equation (32)).